This jolly building sits on one of eastern Ipswich's arterial roads surrounded by late 19th and early 20th century housing. I am not aware that it replaced an earlier chapel on the same site, and the inscription on the end of the frontage tells us that To the Glory of God this foundation stone laid on 15th June 1957. The foundation stone concludes Ubi Christus Ibi Ecclesia,'where there is Christ, there is the Church', which seems curious to find in Latin on a Congregational church. 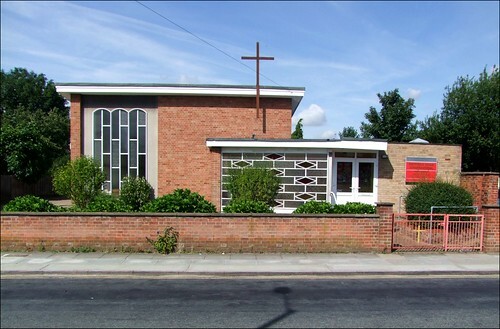 Hatfield Road Congregational did not join the new United Reformed Church in the early 1970s, when the Presbyterian Church of England came together with the majority of former Congregational churches. For a time in the 1990s, there was a sign outside saying Church of Christ, which I believe is a large American denomination, but this has now been taken down. Interestingly, Ipswich has another Congregational Church, St Clement's, less than a mile off into town at the bottom of the hill. The style of the building is very much that of the Johns, Slater Haward Partnership, who added a number of fine, interesting buildings to the Ipswich townscape in the late 1950s and early 1960s, although I am not aware that this is one of theirs. However, Hatfield Road Congregational has echoes of the glass mosaic wall at their Castle Hill Congregational of the previous year, and the canted roofs begin to suggest those at the practice's most important single building, Sprites Schools, of 1960-62, so perhaps they were at work here after all.